A Culture Lost to Thurmond Lake offers readers a unique look into the geographical setting of the western portion of McCormick County, South Carolina, adjacent to the Savannah River a half century ago. 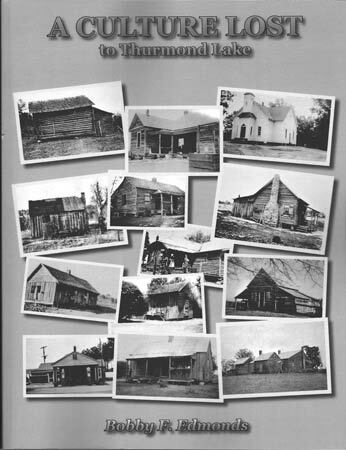 The 378-page book, authored by Bob Edmonds, contains more than 500 never-before-published photographs that provide a window into a world rarely seen and the fascinating story of folks that built America! Between December 20, 1951, and March 2, 1952, people looked out over the rolling hills and prime bottom land along the Savannah River and its tributaries as the waters, backed up by a massive new concrete dam at Clarks Hill, South Carolina, began to swell, slowly inching streams out of their banks. Different people viewed the man-made transformation with different emotions – sadness, indignation, awe, excitement, reverence, amazement, nostalgia, and anticipation – as 70,000+ acres of countryside was forever changed into an eternal body of water. The Clark Hill Project, later renamed Thurmond Lake, consumed 20% of the land area of McCormick County. As the huge lake spread out the project swallowed up forever family farmsteads – homes, barns, storehouses, gardens, orchards; cotton plantations, places of worship, cemeteries, ferry sites, roads, bridges, country stores, the electric power plant on Little River for John de la Howe School, commercial buildings and residences in the town of Parksville, the historic Louis Chamberlain home, the kitchen building at historic Badwell Plantation and other historic sites including the ruins of Fort Charlotte where the seizure of the fort and its stores of munitions by newly-organized Patriot forces played a significant role in getting the American Revolution off the ground in the South Carolina back country. Finally the bulldozers moved in and razed the landscape – every building. Any semblance of civilization was demolished. Here multitudes had been born, lived, and died – where they had experienced happy times, triumphs, sorrows, accomplishments, failures – to where people had immigrated in, migrated in, and from whence some had left for other parts. Miraculously, Edmonds discovered that during the course of the land acquisitions phase for the dam and lake in 1948-49, the U. S. Army Corps of Engineers created and preserved files for the project that included 2×3 inch photographs. 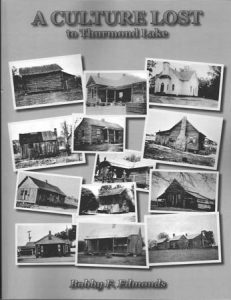 Although these files that contained description of buildings acquired were not intended to be used as architectural, cultural or historic documentation, through data sheets and photography of the 60+ year-old files provide an unusual profile of western McCormick County, South Carolina, in the early twentieth century. The written documentation focuses on the valuation of the parcels to be acquired containing details such as measurements of the structures, number and size of rooms in residences, the building materials used, the use of a particular buildings, such as a barn, a cow shed, a cotton house or a chicken house. A Culture Lost to Thurmond Lake is a considerable contribution to our cultural and architectural history. The book may be purchased for $25 at Strom Drug, Books on Main, Chamber of Commerce, McCormick Messenger, Willington Book Store, McCaslan’s in Greenwood, or from the author at cedarhill@wctel.net. The author will hold a book signing at McCormick County Library at 6:30 PM on July 9th.